“An item of clothing that may not have relevance to one person could mean the world to someone else,” explains Joi Gordon, CEO of Dress for Success. Gordon took on her leadership role at the nonprofit organization in 2002. And she has borne witness to the hundreds of thousands of lives changed by a simple reclaimed suit once destined a landfill that was instead used as a catalyst for putting a woman back to work. While it may be difficult to believe that a reclaimed wardrobe can do the trick of helping a woman gain the confidence to land a job, various studies have linked the positive effects of feeling well-dressed to higher performance outcomes, stronger feelings of self-worth, and feelings of power. Dress for Success understands the science, but most of all, it has both understood and met the need. 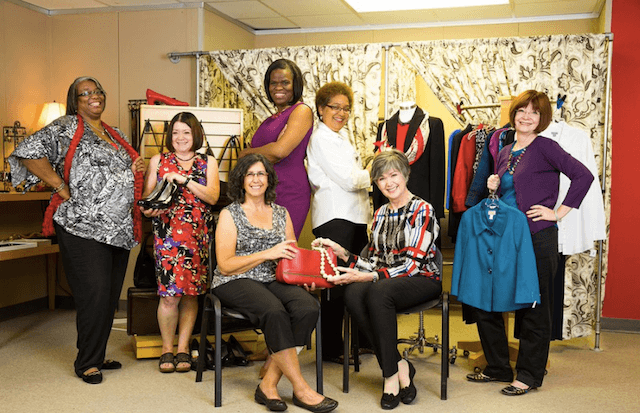 Dress For Success has served nearly 1 million women since its inception in 1997. Boasting over 145 affiliates located in 20 countries across the world, the volunteer-operated clothing boutiques offer a second chance to women overcoming personal hardships, unemployment and other life challenges. What’s most impressive about the organization is the built-in ecosystem that enables multi-person participation beyond the blind-donation model to which we’ve become accustomed. There’s a level of care and commitment to the needs of women that donors can feel good about when providing their intact and stylish discards to Dress For Success boutiques. Through the years, Dress for Success has seen corporate partnership participation run the gamut. Brands like Talbots, Adrianna Papell, Vanity Fair Lingerie, Pandora Jewelry, Spanx and others often donate brand new merchandise, which is then sorted and dispersed amongst affiliate boutiques around the world. From workwear to jewelry to shoes and handbags, the array of donated items provide women with storied pasts a hopeful new beginning. Dress for Success clients are treated like women with potential, starting with being paired with a personal image consultant who works hard to help them shop the donated threads for a pulled-together look that fits them and helps them get on the road to achieving their goals. But the makeover doesn’t stop at the upcycled shopping spree. Clients are also paired with career coaches and mentors who review their resumes and help them practice their interview skills. Some women can even equip themselves with financial literacy classes, computer workshops, and a host of other skill-building opportunities to round out their experiences and compete in the job market. “We have major global brands that sponsor our continuum of services programs such as the Walmart Foundation, which created and continues to fund our Going Places Network Program, and Tracfone, which donates hundreds of cell phones to our women and sponsors our Success is Calling program, a training course in how to ace a phone interview,” Gordon adds. The model goes far beyond the outcome of keeping good clothes out of the waste stream by providing a network of support to women in the form of workforce development, economic equity and community-building within their respective cities. In fact, potential affiliate partners undergo a rigorous, highly selective, year-long application process prior to being granted the go-ahead to open a location in their community. Prior to coming to Dress for Success, Gordon says many of the women the organization serves have never tried on a suit before. Those that land employment are invited back to select an additional five outfits to complete their professional wardrobe for an entire week. At this time, Dress for Success also extends an invitation for women to join its Professional Women’s Group — a networking and professional-development program that offers the tools and support for retaining the job and ultimately achieving economic independence. Many clients remain involved, serving as ambassadors, mentors and volunteers for the organization. Sherrell Dorsey is a social impact storyteller, social entrepreneur and advocate for environmental, social and economic equity in underserved communities. Sherrell speaks and writes frequently on the topics of sustainability, technology, and digital inclusion.